Are you looking for a vehicle that you can plug in and charge up? Are you trying to find a hybrid that performs just as good or better than more traditional vehicles that are available today? 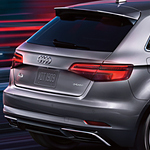 The Audi A3 Sportback e-tron is a compact plug-in hybrid that performs well. You want performance that goes beyond what you will get from a poorly made car, you want performance that is special. The Audi A3 Sportback e-tron features a six-speed transmission that provides this vehicle with the power to perform just as you want it to. There are drive modes that you can use in some vehicles to change the way that the vehicle drives and to customize your experience each time that you get behind the wheel. The Audi A3 Sportback e-tron provides you with drive modes that you can select so that you will have a good driving experience each time that you take this car out.